Magnetization reversal processes of hexagonal dense arrays of bi-segmented Ni and Fe50Co50 nanowires consisting of two well defined diameters (45 and 80 nm) have been studied. The nanowires were grown inside of tailored pores of anodic alumina templates by combined anodization, atomic layer deposition (ALD) and electrodeposition techniques. The experiments have allowed to identify their two-step magnetization reversal process ascribed to the respective segments of different diameter. This is concluded from the differential susceptibility observed in the hysteresis loops, contrary to those for nanowires with homogeneous diameter. These results are also confirmed by the first-order reversal curve (FORC) distribution diagrams, where an elongation parallel to the interaction axis around two coercive field values is obtained, which is correlated to the difference in diameter of the two segments. This well-defined two-step magnetization reversal process through the nanowire diameter design is thought to be very useful for the advanced control of the remagnetization in arrays of magnetic multidomain systems. 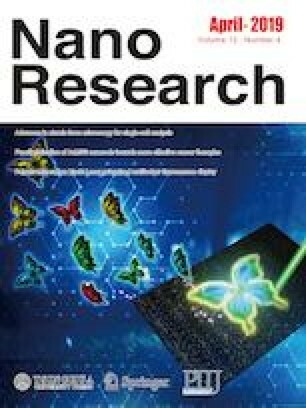 Supplementary material (experimental details of electrochemical synthesis and characterization of nanowires, XRD patterns, and magnetic properties obtained from hysteresis loops) is available in the online version of this article at https://doi.org/10.1007/s12274-019-2385-9. The authors acknowledge financial support from the Spanish Ministerio de Economía y Competitividad (MINECO) through the research Projects MAT2013-48054-C2-1-R, MAT2013-48054-C2-2-R, MAT2016-76824-C3-1-R and MAT2016-76824-C3-3-R. The scientific support from the SCTs of the University of Oviedo is also acknowledged.